Four years ago this week, an earthquake off the Japan coast unleashed a wall of water that devastated coastal cities there -- and caused more than $50 million in damages along the California coast from Santa Cruz to Crescent City. The Tohoku Earthquake and its aftermath are a reminder that the threat of tsunamis is always with us. Especially vulnerable is the state of Hawaii, where scientists have been calculating just how big that threat might be, using evidence that could’ve gone completely unnoticed. 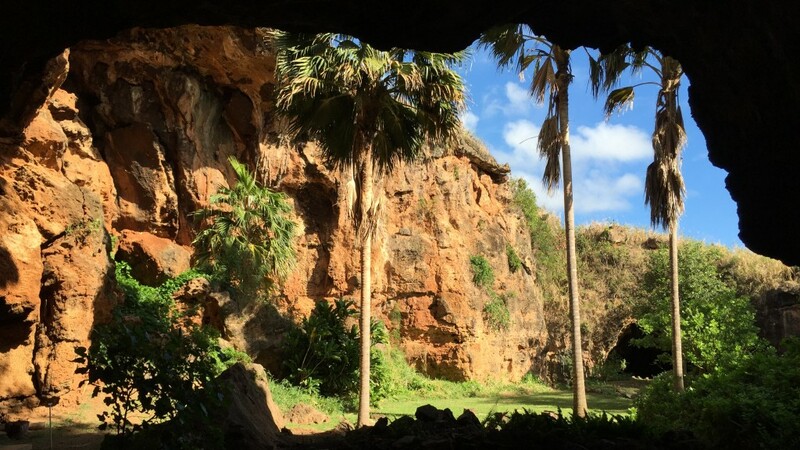 Hidden away on the south shore of Kauai, Hawaii’s geologically oldest island, is Makauwahi sinkhole, a small wonder amid the dense coastal vegetation. 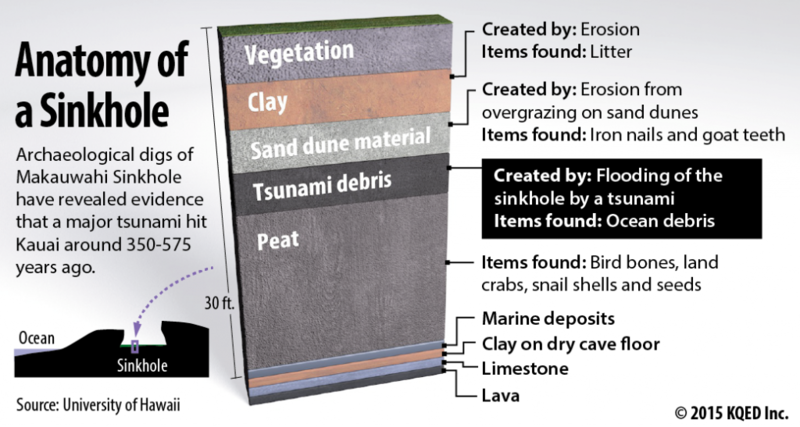 It also contains buried treasure for scientists who study Pacific tsunamis. 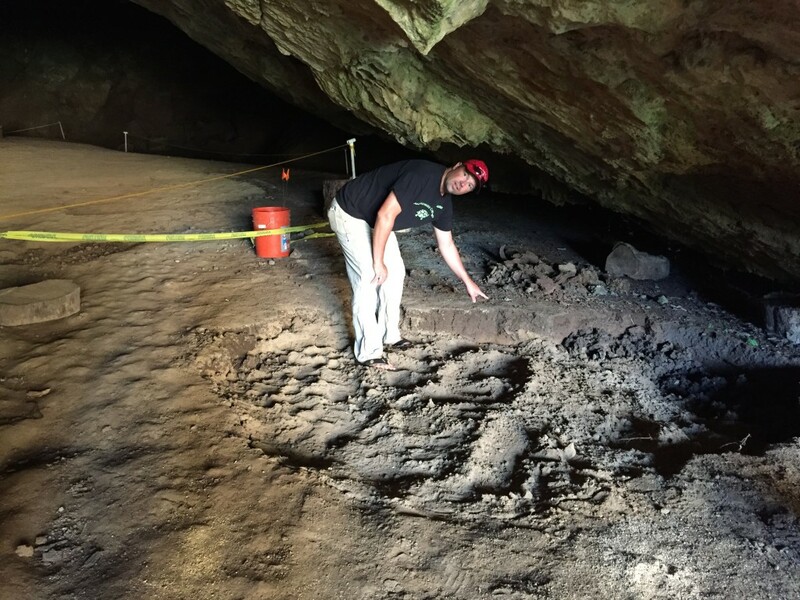 "It’s just a massive old sand dune that has -- scientists will say 'lithified' -- it’s become rock," explains Chris Landreau, an archaeologist who’s worked on digs at the sinkhole. Emerging through a small cave on the north side of the bowl, it presents as its own tiny world, open to the sky, surrounded by sheer walls. Palm trees sprout from the floor of the crater. When biologists entered this world in the 1990s, they soon realized that it was an open time capsule for unmasking the island’s biologic and geologic history. Paleoecologists starting digging down, sifting from the layers of sediments the comings and goings of plants and animals through time. "The idea is to identify those things that are extinct," Landreau says, "and to identify those things that we can still find somewhere locally, and try to revive them." That was the idea. But as they were digging, they struck seismic paydirt: a layer about a yard thick that clearly didn’t belong there. What was there -- basalt cobbles, corals, shells and other ocean debris -- eventually caught the eye of a geophysicist at the University of Hawaii named, yes, Rhett Butler (not to be confused with this Rhett Butler). He noticed that this was obviously stuff that came from the ocean, not the residue of plants and animals that would've lived on the island. And there was a lot of it. "It’s a huge volume," Butler says. He calculates about 600 cubic yards, or enough debris to fill nine ocean containers, the kind you see stacked up on cargo ships. "It takes a heck of a lot to move that much material, move it from the beach, move it up the hill," reasons Butler. 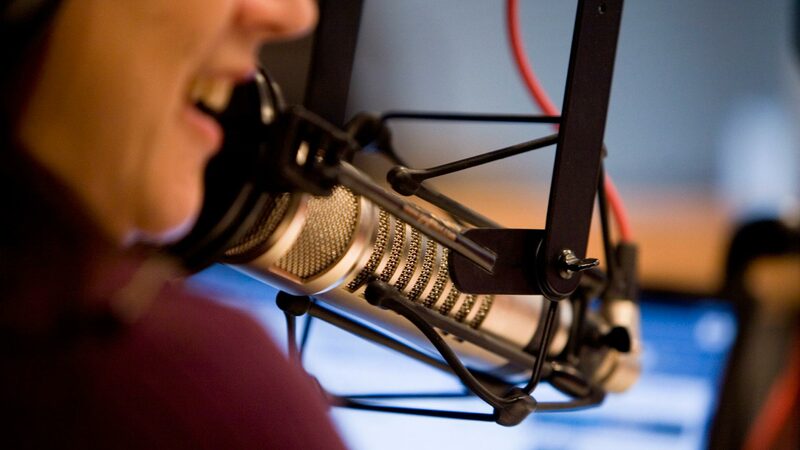 "So the most likely scenario, quite frankly, is that it’s a tsunami." It would have to have been huge -- big enough to hurl 200-pound boulders into a hole that’s two to three stories above sea level and set back from the shoreline about the length of a football field. Butler reckons that it hit Kauai sometime between 350 and 575 years ago. Butler began using computer models to trace such a tsunami back to its probable origins. That led him to a seismically active zone nearly 2,000 miles north, in the eastern Aleutian Islands, off Alaska. "And the shape of the subduction zone," he notes, "in other words where the Pacific and North America converge together -- if you look at that geometry, it basically focuses energy directly toward Hawaii." His modeling work points to a quake bigger than magnitude-9 -- that's 100 times more powerful than San Francisco’s Big One in 1906, or at least as powerful as the 2011 Tohoku event that savaged coastal Japan. "It’s a similar sized event to Tohoku, maybe slightly bigger," Butler estimates. In fact, he thinks it might've been the Pacific’s biggest quake in the past 7,000 years. At the rate that tectonic plates near the Aleutians have been moving since the Kauai tsunami, he calculates that the region is capable of producing a similar quake, at any time. "Once you start modeling it and looking at the possibilities," Butler says, "you realize it's not unreasonable that we could get a magnitude-9 in the worst possible spot that would make all the other events look rather small in comparison." While a tsunami of that size 500 years ago would have been devastating to Hawaii’s primitive coastal culture, today civil defense authorities estimate that 370,000 people and $40 billion worth of infrastructure stand in harm’s way in the islands' existing tsunami zones. "For California, a tsunami is a nasty event but it happens within a mile of the coast," Butler says. "The rest of the state is not affected. One of these things in Hawaii devastates the whole state." Partly as a result of Butler’s work, Hawaii officials are in the process of redrawing tsunami maps to take into account the possibility of something much bigger than is in the historical record. "Basically letting the people know where the safe zone is, which is the essence of the whole thing," he says. "It’s to save people’s lives." 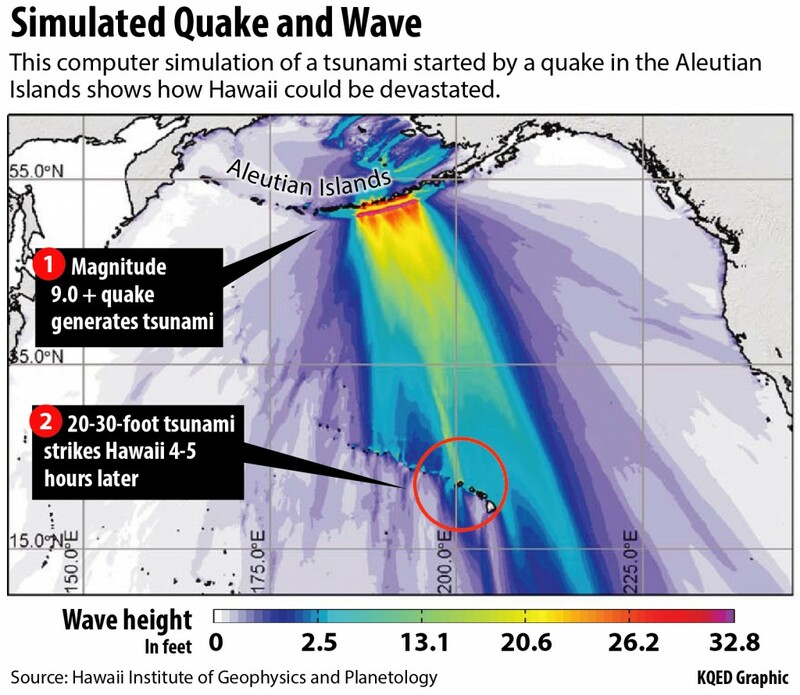 Computer modeling shows how an earthquake in the eastern Aleutian Islands would focus tsunami energy toward Hawaii. The green band above Kauai, in particular, shows how the contours of the ocean floor focus even more of the energy directly on the state's northernmost island. Actual wave heights at landfall could be greater than colors indicate. A lot of progress has been made toward that end in the last 10 years or so. A network of ocean buoys and other sensors keep watch for tsunamis. The U.S. maintains 39 buoys and other nations have added about 20 more to the network, known as DART. But keeping them working in harsh ocean environments is a challenge. And currently about a quarter of the U.S. network is out of service. Butler has suggested adding two more buoys to the Aleutian chain. Paul Whitmore, who directs the National Tsunami Warning Center in Palmer, Alaska, says there are no plans to do so, citing the costs involved. Butler has also suggested adding sensors to transoceanic cables that traverse the north Pacific. Whitmore says while officials have talked about that "for years," deployment costs have been a barrier. Meanwhile, Butler says were a similar event to happen today, "We only have, literally, 4 ½ hours. Imagine you snap your fingers and 4 ½ hours later, there’s a wave coming on shore that’s massive. So we’re very concerned about improving tsunami warning capabilities." Butler is seeking funding from the Federal Emergency Management Agency to search for other sites in the islands that would tell us more about this and other tsunamis in the distant past that might portend future events. 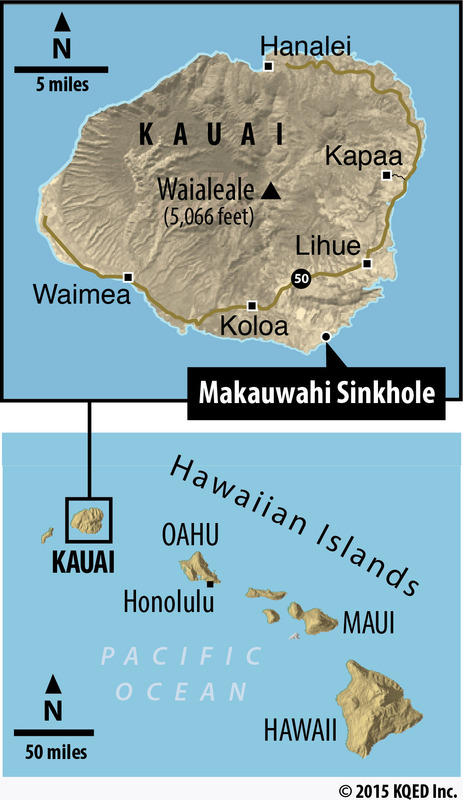 Right now, Makauwahi sinkhole is the only evidence found of the mega-tsunami of 500 years ago. By comparison, Butler muses that one small town in Oregon -- Seaside -- has "over 300 paleotsunami measurements of a former Cascadia event, whereas in all of the Hawaiian islands, we have precisely one."